The Cleveland Cavaliers completed their regular season series win over the Milwaukee Bucks with a 102-95 win last night. The game was tightly contested through three and a half quarters, but the Cavaliers went on a 11-0 run with just under 5 minutes in the fourth to help put away the Bucks. That 11-0 run was sparked by a LeBron James and-1 slam to put Cleveland up three at the 4:45 mark. James returned to the lineup after missing one game with an illness and didn’t miss a beat, pouring in 24 points while grabbing ten rebounds. Cleveland out-rebounded the Bucks 51-40 and shot the ball much better at the charity stripe. Cleveland connected on 84 percent of their free throws while the Bucks hit on just 62 percent. The Bucks had dominated Cleveland in the paint in the previous three match ups this season despite only winning one of those games. However the Bucks only managed to score 38 points in the paint last night, which the Cavaliers were able to match. Another statistic worth noting from last night’s game; Kyrie Irving became the eighth player in Cavaliers history to reach the 2,000 assist mark. Irving joins his teammate LeBron, who is first on that list of eight with nearly 6,000 assists as a member of the Cavaliers. Antetokounmpo had an off night for his standards. While he stuffed the stat sheet in every other category, he, along with most of the Bucks struggled shooting the ball. However there was one stat the Bucks can be happy about. They only committed eight turnovers on the night which is well under their 13.7 average. Not only that, the Bucks forced Cleveland to commit 16 turnovers on the night. Unfortunately for the Bucks, there is more bad news on the injury front. After losing Jabari Parker to a torn ACL and Kris Middelton not being healthy enough to play in back-to-back games, Michael Beasley leaves last nights game with a knee-sprain and is out indefinitely. For the Cavaliers, they finished the month of February with a 9-2 record. Coming off the teams worst month since LeBron James returned to the Cavaliers, they managed to have one of the strongest months of basketball all season. Cavs fans have more to look forward to in the near future as well. Cleveland signed Deron Williams after his buyout with the Dallas Mavericks was complete. Williams didn’t play in last night’s game, but should be in the lineup for tomorrow night. The Cavaliers will be on the road tomorrow night in a matchup against the No.2 team in the Eastern Conference, the Boston Celtics. Tipoff is set for 8:00 p.m. on ESPN. The Gators are National Champions yet again. The No. 1 Florida women’s tennis team took on the No. 2 North Carolina Tarheels in yesterday’s ITA National Indoor Championship, and what a match it was. It all came down to a battle of the underclassmen as Florida freshman Ingrid Neel took down UNC sophomore Jessie Aney to give the Gators a 4-2 win. In the ITA’s 30th year of existence, 15 teams squared off in hopes of becoming national champions. This was Florida’s 17th appearance in the event, but just their second time in the last six years. The Gators all-time record at the ITA’s is 52-13, with five of those losses coming in the NTIC Final matches. It wouldn’t be an easy road to the title, but the Gators pulled it off. With Neel and Aney facing off on court three of Yale University’s Cullman-Heyman Tennis Center, the two would split the first two sets. With all the marbles on the line in the third and final set. Keep in mind, Neel isn’t just a freshman. She’s a freshman who enrolled at the University of Florida in January, so her collegiate experience was minimal. However, the lights weren’t bright enough to keep this freshman from her ultimate goal, becoming a champion. Neel took a 4-1 lead, but Aney would hold and break. She won the next two points before Neel was able to steal another one away, taking a 5-3 match lead. Aney would be the one to strike first in the ninth and final game, winning the first two points. But in the end, it was too much of the freshman phenom, as Neel would go on to win the next four points, clinching the title for the Gators. The Gators can’t celebrate for too long, with their season continuing this Saturday. Florida will put the longest active home win streak by any NCAA Division I team in any sport on the line this weekend as the No. 5 Oklahoma Sooners and the No. 4 Standford Cardinals come to town. The Sacramento Kings have been one of the most disappointing teams in recent memory. For those who are not aware, the Kings haven’t made the playoffs since the 2005-2006 season. You thought a 10-year postseason drought was bad, the Kings haven’t won a playoff series since 03-04 season. However, the Kings have arguably the best Center in the NBA, Demarcus Cousins, and young talent around him which bodes well for the future. Well not anymore. News broke Sunday night after the All-Star game that Cousins was traded to the New Orleans Pelicans. Might I add that Cousins was in New Orleans when he found out about the trade. It’s not as much of a question to why Cousins was traded. The question most of the world had was why trade him for so little? The Kings received rookie Buddy Hield, Tyreke Evans, Langston Galloway, and for the Pelicans first and second round picks in the 2017 draft. According to Kings General Manager Vlade Divac, the Kings received a better offer over the weekend, but ultimately decided trading him to New Orleans was the best choice. On paper that looks like the Kings got a good amount in return, but if the rumors of the Kings buying out Evans’ contract are true then the Kings are essentially getting Hield and a first rounder for the best Center in basketball. Sure, Cousins has been one of, if not the best big men in basketball since entering the league. He has also been one of the most criticized players in the league for his issues on and off the court. For those reasons, it made sense for Sacramento to part ways with Boogie Cousins. What could possibly be wrong about a guy who can give you 30 and ten every night? Well there’s nothing wrong with that, but what if that player gets suspended multiple times each season? Demarcus Cousins has a history of getting frustrated mid-game and letting his emotions get the best of him. Here’s just one example of a classic Demarcus Cousins temper-tantrum. This was just one of the most recent outbursts from Cousins. He has a league high 19 technical fouls this year. To put that in perspective, the NBA suspends players for a game after receiving their 17th technical foul. The second half of the season hasn’t even started and Cousins has already been suspended due to techs. However this behavior has been pretty consistent throughout Cousins’ NBA career. With the trade deadline coming on February 23rd, Divac said moving Cousins now was the right move for the teams future and culture. However the Kings are sitting just a game and a half behind for eighth place in the Western Conference. Does trading your best player for close-to-nothing really help a teams playoff chances? As mentioned before, the Kings received a better offer for Cousins late last week, but decided it wasn’t the right time to part ways. Sacramento didn’t have a first-round pick in the 2017 draft, so adding picks was a necessity for the Kings. Adding young talent is important for any franchise, but this years draft class is being classified as one of the best classes of this decade. The Kings managed to get a little younger in the trade, acquiring Buddy Hield who at this time last year was the talk of collegiate basketball. Hield has had a solid rookie year, averaging just under nine points and three rebounds per game. The question still remains: why trade Cousins now? Well, part of the reason why Sacramento made the trade with New Orleans might have to do with the Kings owner Vivek Ranadive. According to him, Buddy has “Steph Curry” potential. If Heild can turn into half the player Curry is, then the Kings made a good decision bringing him to Sacramento. Cousins has been surrounded by trade rumors for the last two seasons, but he has only gotten better since the start of last season. Cousins continues to improve in all assets of the game, except the fact he can’t seem to keep his cool. Ultimately, that was enough for the Kings to part ways with Cousins. 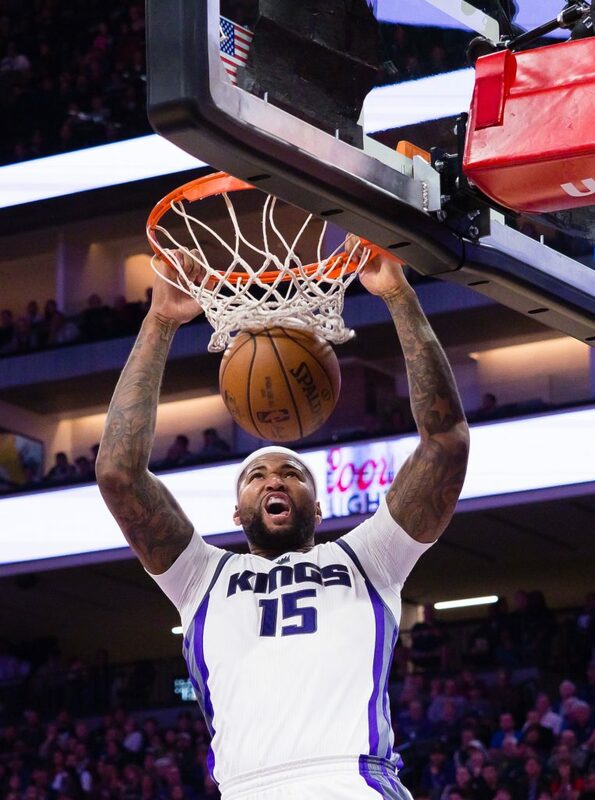 Time will tell if the Kings made the right or wrong move, but for now, Cousins says goodbye to Sacramento as he heads to his new home in New Orleans alongside Anthony Davis. The Cleveland Cavaliers are on the road on Valentine’s day to take on the Minnesota Timberwolves. The was a rough first month of 2017 for Cleveland, but they have gotten back on track in February. Cleveland has started out the month winning five of their first six games, with the only loss coming at Oklahoma City. Cleveland had no trouble handling Minnesota earlier this month, winning that one at home 125-97. LeBron James led the way for the Cavs with 27 points, while grabbing eight boards and dishing out 12 assists. Kyrie Irving also managed a new career high in assists with 14. On the Timberwolves side, Karl Anthony-Towns finished with 26 points and 12 rebounds, while Andrew Wiggins contributed 23 points of his own. The Wolves had trouble on the defensive end of the floor that night in Cleveland. Not only did they allow Cleveland to score 125 points, but they allowed them to shoot nearly 54 percent of their field goals while shooting 40 percent from behind the arc. Anytime Cleveland is in town, fans flock to watch their team go up against LeBron, Kyrie, and Kevin Love. However Timberwolves fans will only see two of the three in action tonight. Former Timberwolves and current Cavaliers All-Star forward Kevin Love will miss the next six weeks after undergoing a successful, yet minor knee surgery. The last time these two teams met Love was unavailable to go due to back spasms. Cleveland will also be without Iman Shumpert and J.R. Smith who are both dealing with their own injuries. Meanwhile the Timberwolves will be without two-time slam dunk champion Zach Lavine, who is out with a torn ACL. Tipoff is set for 8:00 PM and will be broadcasted on NBATV.